In a new research consortium, scientists from the "Hopp Children's Cancer Center Heidelberg" (KiTZ), together with working groups from Ludwig Maximilian University of Munich (LMU) and the West German Cancer Centre (WTZ) of Essen University, have teamed up to advance research on Ewing sarcoma and derive approaches for novel diagnosis and therapy methods on this basis. The Gert und Susanna Mayer Stiftung will support the project by providing funds of €1.5 million over a five-year period. 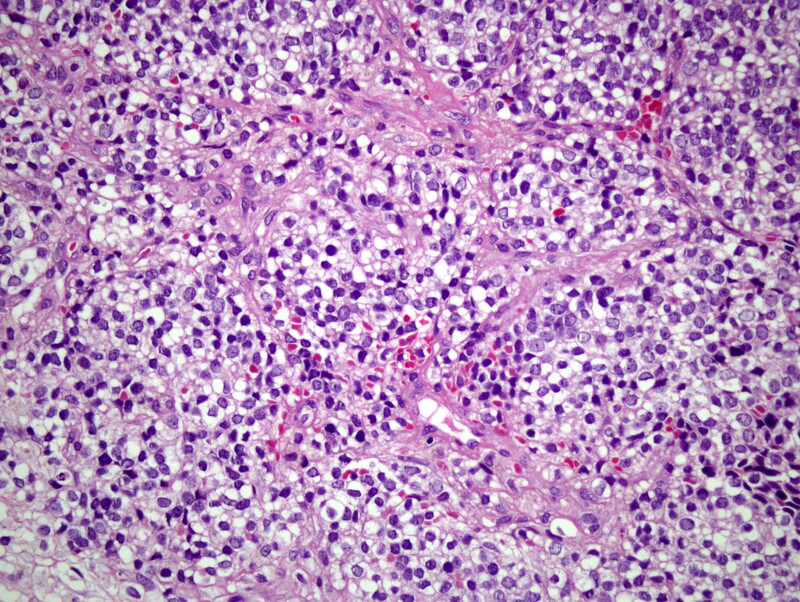 Ewing sarcoma cells are small, round and undifferentiated. Without using molecular analysis technologies, it is hard to differentiate them from other tumor cells, which often complicates and delays diagnosis. Ewing sarcoma is the second most frequent bone cancer, following osteosarcoma, in children and young people. Present therapy strategies lead to relapses in about one third of patients – usually with fatal outcome. Although our understanding of the tumor biology of Ewing sarcoma has grown significantly over the past few years, it has not been possible to achieve any significant improvements in the rates of cure. Three scientific working groups from Heidelberg, Munich and Essen – part of the clinical network of the German Cancer Consortium DKTK – have now set out to change this. In a collaborative network called "Translational Ewing Sarcoma Research Consortium", they will pursue research on Ewing sarcoma using it as a model for other types of cancer. The researchers plan to investigate how the innate genetic variability of the tumors interacting with acquired genetic changes influence the course of the disease. They intend to use the findings of their investigations to derive approaches for personalized therapy of cancer in children and youth. "We plan to generate a genomic atlas of Ewing sarcoma that will comprise clinical, histological and molecular-genetic information on Ewing sarcoma and similar types of tumor," said Stefan Pfister, division head at the German Cancer Research Center (DKFZ), director of the KiTZ Preclinical Program and also a senior physician at Heidelberg University Hospital (UKHD). Additionally, the researchers aim to find approaches for potential immunotherapies by characterizing the immune cells invading Ewing sarcoma cells, using the most advanced technologies. The Munich group will have the task to elucidate the molecular variability of Ewing sarcoma using genetic and epigenetic methods. "We will search for genes that may help in predicting the course of the disease in Ewing sarcoma patients and might be potential therapeutic targets," said Thomas Grünewald, head of the Max Eder Junior Research Group for Pediatric Sarcoma Biology at LMU's Institute of Pathology. The Essen team will simultaneously be working to identify and validate biomarkers that can be used to predict therapy response. A focus will be on identifying biomarker candidates from so-called liquid biopsies. The team has much expertise in analyzing liquid patient samples such as blood, bone marrow and urine. "Tumors leave tracks in these body fluids and we want to learn how to read them using liquid biopsy," said Uta Dirksen, a pediatric oncologist, vice director of Pediatrics III at Essen University Hospital and head of the International Cooperative Ewing Sarcoma Study Group. "In this way, we hope to identify the factors leading to the formation of micrometastasis in Ewing sarcoma." The collaboration is a five-year project that will be launched in November of this year. The Gert and Susanna Mayer Foundation will provide €1.5 million to support the consortium. Use is free of charge. The German Cancer Research Center (Deutsches Krebsforschungszentrum, DKFZ) permits one-time use in the context of reporting about the topic covered in the press release. Images have to be cited as follows: "Source: Grünewald/LMU München". The „Hopp Children's Cancer Center Heidelberg" (KiTZ) is a joint institution of the German Cancer Research Center (DKFZ), Heidelberg University Hospital and Heidelberg University. As a therapy and research center for oncologic and hematologic diseases in children and adolescents, the KiTZ is committed to scientifically exploring the biology of childhood cancer and to closely linking promising research approaches with patient care– from diagnosis to treatment and aftercare. Children suffering from cancer, especially those with no established therapy options, are given an individual therapy plan in the KiTZ, which is created by interdisciplinary expert groups in so-called tumor boards. Many young patients can participate in clinical trials which ensures access to new therapy options. Thus, the KiTZ is a pioneering institution for transferring research knowledge from the laboratory to the clinic.